DGVARI, GEORGIA. 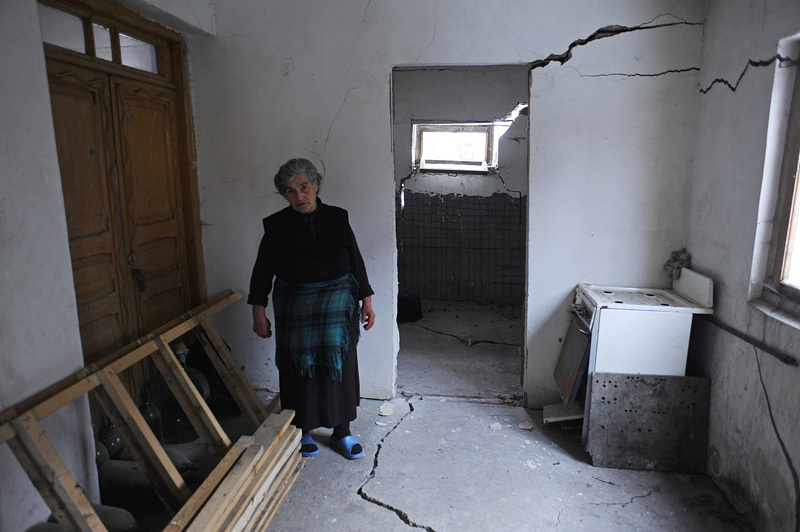 Zhenia Gogoladze, 68, outside her house which has been partially destroyed by cracks appearing after a 2007 earthquake in Dgvari, Samstkhe-Javakheti region, Georgia, one village over from Tadzrisi from where the Baku-Tbilisi-Ceyhan (BTC) oil pipeline crosses through the Caucuses mountains, on January 22, 2012. Due to soft soil, many homes in Dgvari have cracked due to landslides and earthquakes and experts have asserted that the pipeline construction, which included controlled blasts, in the mountain villages near the city of Borjomi may have helped accelerate the pace of seismic activity in the region, although locals believe the pipeline construction are unconnected to recent earthquakes and landslides.